Professional beach volleyball player (and former Houston resident) Alicia Polzin sent me a box of Meyer lemons off her tree in California. These lemons were beautiful, floral, juicy, and seedless. 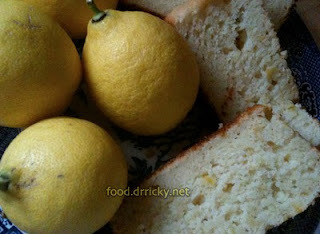 Some of them I used to make the lemon cream loaf cake pictured above, but I wanted to send her some of the lemons back to enjoy. So, I made candied lemons. I believe her exact words were: "Holy chewy yummy nummy!" Then she threatened me with bodily harm if I don't send her the recipe. Well, this posting is all about avoiding getting hurt :). 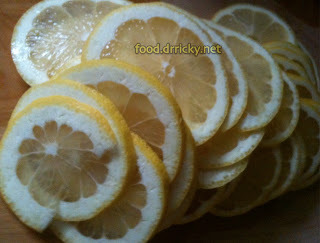 First, we start by slicing the lemons into thin slices, rind and all. Not that there isn't a seed in sight. Then I prepared a simple syrup by dissolving two parts of sugar to one part of water, and heating it until it is warm. Slide the slices into the syrup one at a time to ensure that each piece is completely surrounded by syrup. It's easy to end up with two pieces sticking together, and then not getting candied. Keep simmering for about 15-20 minutes. Then turn off the heat, and let it cool in the syrup. Be patient. I left mine in the syrup all day. The tricky part is drying the slices. I didn't have the room for a proper dehydrator, so I just laid the slices out on a Silpat sheet, and stuck it in the oven at 150F overnight. 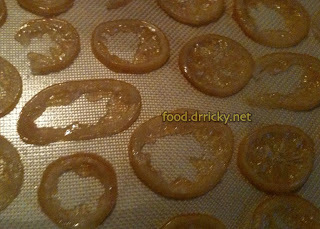 The next morning, you have candied lemons. If they're sticky, you can roll them in sugar, but, really, they should come out like lacy stained glass windows. Oh, don't throw away the resulting syrup. 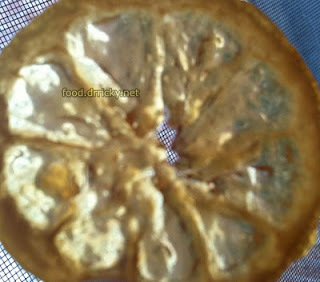 So much pectin will be leached out that you have this great lemonade base. I like dissolving some in soda water for a quick refreshing beverage. I wish I'd had this recipe when my Meyers were around. I guess I'll have to wait until next year. Great idea!